Why should horn players have all of the fun? Now, the number one selling Jazz Improvisation book in the world has a whole new look! 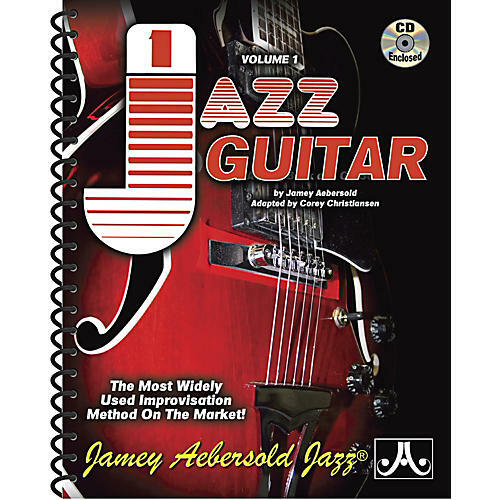 Introducing a new version of Jamey's world famous "Volume 1 - How To Play Jazz And Improvise," completely revised and specifically tailored for guitarists by jazz great Corey Christiansen! This edition is perfectly aligned with the original classic Sixth Edition that introduced tens of thousands of musicians to essential jazz fundamentals such as scale/chord relationships, articulation, note choices, etc. In this special version, however, the text has been carefully edited and rewritten to speak specifically to guitarists. Even non-reading players will benefit, because we've also included TAB and FRAMES for each of the musical examples. The piano track from the original CD has been replaced by Corey on guitar, and many of the chords and voicings are explained and notated in the book. The play-a-long/demonstration CD includes special stereo separation, allowing the guitar on each track to be eliminated so that the student can play along with bassist Rufus Reid and drummer Jonathan Higgins. This high-quality book is spiral bound, designed to lie flat for ease of use. A complete package!